TAKE School of Japanese Swordsmanship engages in the study of Tenshin Shoden Katori Shinto Ryu as taught by Yukihiro Sugino sensei. It is based in Cracow and Lublin, Poland. Katori Shintō-ryū is one of the oldest Japanese martial arts, and is revered as a koryu bujutsu, “the Old Way school”. The art has been continuously passed from teacher to student since its founding in 1447 by Iizasa Chōisai Ienao. 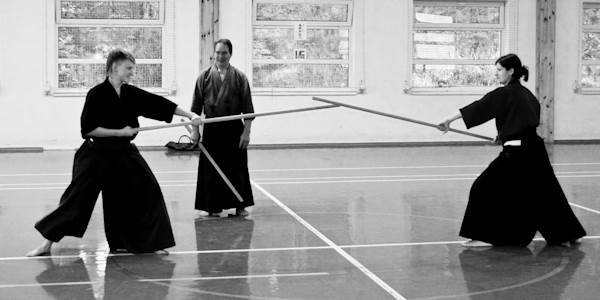 Students of Katori Shinto Ryu study a comprehensive system of martial arts that includes Japanese swordsmanship (kenjutsu) and sword drawing techniques (iaijutsu), as well as the use of two swords (ryotojutsu), the stick (bojutsu), the naginata (naginatajutsu), and the spear (sojutsu). TAKE dojo was founded by students of Goro Hatakeyama sensei (deceased) and Yukihiro Sugino sensei, both close students of famous martial artist, master Yoshio Sugino. Our trainings are open to everybody – if you are interested, feel free to have a look at our practice anytime. If you wish to join the dojo, come 15 minutes earlier. There is no need to have an equipment on the first training – comfortable clothes only. More details on discounts and payment given before first training.